That pacifist who kept Tibetan refugees and Burmese spies in his home? That was how many of us on the military beat reacted when A.B. 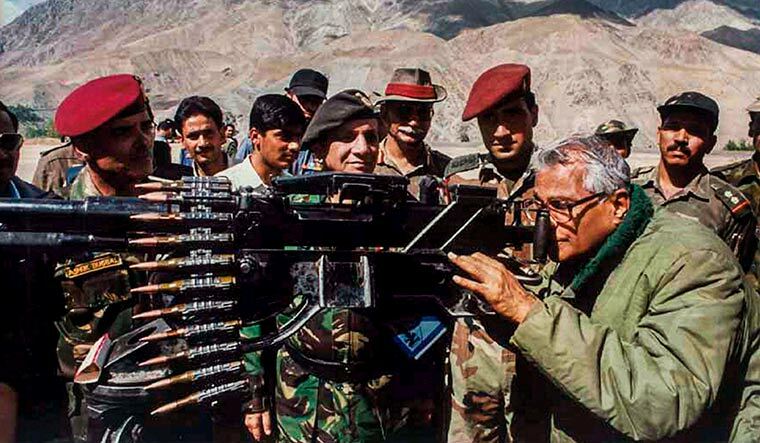 Vajpayee ‘inducted’ George Fernandes as his defence minister in 1998. He will slash the defence budget and, given his sympathy for the Burmese rebels, may reverse the previous three regimes’ outreach to Myanmar, we concluded. George had had a stormy petrel reputation—the socialist who had humbled Indira Gandhi’s fund-raiser S.K. Patil in his South Bombay redoubt; brought every train to halt in the great Indian Railways strike; had gone to jail for plotting to dynamite the rail tracks and offices in Baroda; won the 1977 Emergency polls from jail with a brute majority; used to self-drive his rickety Fiat to office as minister in the Janata government; had kicked out giants Coca-Cola and IBM from India; had travelled in the guard’s cabin of a goods train to reach a public event on time; had performed the most shameful Aaya Ram-Gaya Ram feat when he defected to Charan Singh minutes after putting up a stellar defence of the Morarji Desai government in a no-confidence motion; had given the blushes to every ace lawyer in India with his brilliant debate in the Lok Sabha over the impeachment of Justice Ramaswamy; and had links with every rebel with or without a cause. He would prove to be a thorn on the Vajpayee regime’s side, we thought. Our eyes popped out. We looked at each other. Mantriji had blurted out what was then (no longer) a secret; but who will bell the cat? Knowing his temper, no officer would. We worked out a deal. TV cameras would delete the Prithvi byte, and we would not print. Instead, a line was drafted for all of us to use: “Prithvi has been ‘inducted’”. It was not headline news, but we did not mind. Then on, we had the finest relationship that a bunch of mediamen can ever have with a defence minister. He had been known to keep an open house (see tailpiece); now on, he kept an open office too, so to speak. He joined us often for fireside chats at Delhi’s myriad military messes where generals, joint secretaries and DRDO nerds drank whiskey with us, as he sipped red wine or fruit juice. No state secrets were revealed, but a lot of information was given. He taught the military to trust the press; and he made the press have faith in the military. Yet we mauled him when we thought he was wrong. When he sacked Admiral Vishnu Bhagwat (the first ever firing of a chief), many of us wrote against it. THE WEEK ran a cover story that was critical of George. When he ordered a sweeping probe into defence purchases of the previous 15 years, I wrote against it in THE WEEK. Yet he had no rancour. He still welcomed all of us into his office, home and the messes. That helped him in running the ministry. During Kargil, he let the generals fight and the diplomats speak. He ran a good ministry, and kept his counsel even when he disagreed with foreign minister Jaswant Singh, who broadcast the secretly-recorded phone chat between Gen Parvez Musharraf and his chief of general staff over how the two had plotted Kargil. The broadcast helped India build its case in the world’s eyes, but “that wasn’t wise,” George told some of us off the record. He proved to be right; as a R&AW officer would reveal later, the broadcast had compromised a R&AW source. When we walked into his South Block office past nine in the night wanting to know why and how a Pak Navy Atlantique was shot down over the Kutch marshes in August 1999, he gave us coffee and a lot of dope on the terrain, about the radars, the combat air patrol drills, ground deployment and what exactly had happened. The next morning, he arranged for 40 of us to be airlifted to Kutch to see for ourselves whether the spy plane had indeed fallen in Indian territory. We even had our share of ‘combat’ thrill when our helicopter was fired at from the Pakistan side. Convinced, the media made the case for India in the next days’ newspapers and TV channels. No wonder, India won the case at the International Court of Justice. The Tehelka sting and the coffin scam hurt him badly. He stayed out for a while from the government, and an overcautious ministry sat on purchase decisions. When he returned to the ministry, he declared bluntly: “I will stick my neck out.” And he did. From the frequent travels he made to the front positions including his bimonthly trips to Siachen, and the deep attention he paid to military briefings, he learnt of the military’s needs. For the Siachen trooper, he got fibreglass shelters, pipe-pumped kerosine, better boots and coats, phone lines, home-like meals and even chocolate bars. When two joint secretaries sat on a file for purchase of snow-scooters, he sent them packing to Siachen for a week’s stay. When the 9/11-outraged George W. Bush and his secretary of state Colin Powell took Musharraf into confidence and began pounding the Taliban-held Afghanistan, George scoffed at the bombs that could do nothing more than “melt the snow” on the Hindukush. With the campaign going nowhere, Bush sent his defence secretary Don Rumsfeld to talk to Putin. From Moscow, Rumsfeld flew to Delhi and met George. George is said to have impressed on him, as had Putin, the need for taking the Moscow-Delhi-friendly Northern Alliance into confidence. One does not know how the deal was worked out, but the world soon saw the Northern Alliance walking into the Taliban-freed Kabul, leaving Musharraf seething in Islamabad. By George! we don’t have many like him. TAILPIECE: The outhouse of George’s MP’s bungalow on Krishna Menon Marg sheltered several Burmese and Tibetan activists. This worried the security men who were guarding the bungalow of Narasimha Rao’s home minister S.B. Chavan, who lived across the road. As they made a practice of shutting George’s bungalow gates whenever the minister drove out, an irked George got his bungalow gates removed. Then on, he ran an open house, literally.